I have been involved in international and Israeli folk dancing for a long time. Back in the late 1990's, just before establishing this website, I was aware that Israeli dances sometimes had Eastern European/Hasidic influence. That's where my knowledge ended. One day, while I was reading about Hasidic dance as part of preparation for my Canadian Dance Teacher's Association exam, I came upon a statement to the effect that Patsh Tanz was a traditional wedding dance used to welcome new brides into the fold of married women. It was like they say "Columbus discovered America" for me. Did this mean that there were specific, traditional Jewish folk dances in Eastern Europe that were associated with the wedding ritual? Thanks to the internet, I found out about a book by Nathan Vizonsky that described a number of these dances. Thanks to the Jewish-Music internet discussion group, I met some people who are also interested in our dance heritage and referred me to other references and experts in the field. This web page explains what I have found so far. I welcome comments, links and dance descriptions from other like-minded individuals. You may ask, why did this dance form almost disappear from the Jewish community? It did not completely disappear. Certain bits and pieces of the dances do reappear at times, in the jumble of obligatory circle dancing that usually happens at weddings and bar mitzvahs. But the integrity of these dances has been lost and only tiny remnants remain in the community. During the holocaust, the shtetlach (small Jewish settlements in Eastern Europe) where the dances were once done were destroyed along, with many of the inhabitants. Those who survived assimilated and for the most part did not continue to do these dances for very long after the war. The state of Israel was created, drawing attention to the new Israeli folk dance culture. The older dance repertoire was abandoned by most people. The decline of klezmer music and dance in America is explored in an article by Zev Feldman. He points out that klezmer music was marginalized by the Jewish community and was never supported by Jewish institutions such as schools and synagogues. Without this support the music could not survive very long in the transplanted Jewish community. Because more secular values were adopted by American Jews, the community also actually chose to discard traditional dances that had previously been associated with orthodox Jewish weddings. However, klezmer is with us again, revived and revitalized, as they say. Who can sit still when listening to this fantastic music? You have to dance. There is a beautiful simplicity to traditional dances like the freylekhs, that welcomes everyone to join in, regardless of age, virtuosity or experience. If you read about shtetl dances or watch old Yiddish movies, you will come to realize that the dances usually involved a good deal of improvisation; i.e. they weren't choreographed dances. You will also notice that the dance descriptions in all of the older folk dance manuals are choreographed to suit the recreational dance setting. 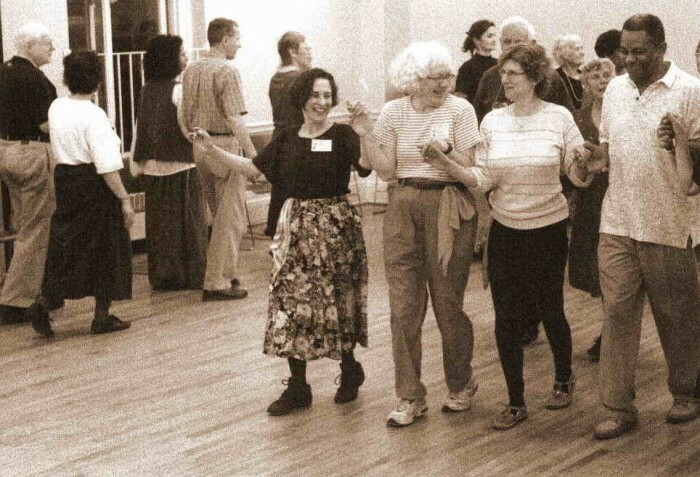 However, the dances now being taught at the Yiddish dance workshops tend to be more like the shtetl versions with more emphasis on improvisation. As with all folk dancing, the best way to learn the dances is from someone who knows how to do them rather than using a cookbook approach. The difficulty remains that not everyone can attend the workshops for financial/geographical reasons. So, here is a place to start learning.